The Bicycle Thief exudes a relaxed, come-as-you-are feel, in an atmosphere that blends Old School style with New School attitude. Enjoy North American food infused with Italian soul. Drop by for lunch or enjoy a full multi-course dinner featuring salumi boards, fresh local seafood, mouth-watering meats and pastas, and decadent desserts. 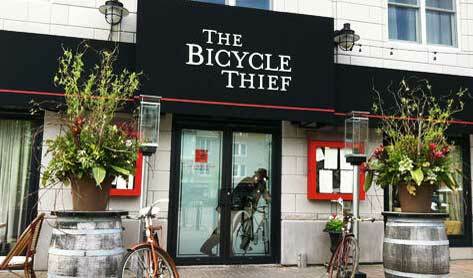 Pull up a chair at The Bicycle Thief’s legendary wine bar for a fantastic glass from their titanic selection. Winter no longer means the end of patio season at The Bicycle Thief. No matter the temperature, you can stay warm at the Champagne bar. In the warmer months, enjoy some of Halifax’s finest waterfront dining truly on the waterfront—The Bicycle Thief boasts an outdoor summer patio just steps from the harbour.